I am starting this thread where I am going to put questions regarding P&ID review; as I am going through that phase right now. to put all the future questions in this same thread; and just on top (as i did in this message) mentioned the title that speaks about the nature/topic of the question/message. I request anybody whom going to ask any questions regrading the P&IDs in Technical Forum, please have them in this thread as per above advise (meaning having the title on top of each message). In this way we can maintain a good database of questions easy for anybody to browse, scroll and serach. I hereby start with the first question as one goes for the first time to review P&IDs. mean to which extent one should go deep into P&IDs. Can anybody pls list down the information or the checklist against which a P&ID 'should' be reviewed by a Piping Engineer. First, from a Piping Group stand point there should be three people from Piping in any P&ID Review meeting. Each of these people have different interests and different responsibilities for the ongoing project effort. However there is a great deal of overlap in the interests of each. The Design Supervisor is interested in where each line starts and finishes, what is in the line, what the state of the commodity is, the pressure and temperature of each line, the material of each line. This interest is primarily for proper line routing, flexibility and support. The Piping Material Engineer is interested in much of this same information but for different reasons. The Material engineers interest is so the correct material can be selected for the Line Class Specifications. The Pipe Stress Engineer in interested the information that relates to the need for stress analysis and the determination of which lines must be submitted for format calculations. It is a TEAM effort, nor a one man show. Thanks. I understand what you said. OK Let me be specific. Being a design supervisorâ€™s point of view, to which extent the design team should go in reviewing P&IDs. Can you please summarize key elements that must be checked by the Piping Design team. It is not easy to be specific. I wish I could be there in the review room and be able to guide people on what to ask and why. To me a P&ID review is both a process and a milestone. P&ID - One of the primary deliverables of the Process Engineer on any project. P&ID Review - This is a group meeting held and chaired by the Process Engineer to discuss the plant/unit before the P&ID is issued for design. All changes, additions, deletions, notes, etc. are updated prior to the IFD release. Issued For Design (IFD) - For the P&ID this issue is the start of detailed design for piping and most others on a projects. The Process Engineer should pin all the P&ID's for the specific Unit up on the walls of a conference room. The attendees sit around a table where they can see the P&ID's and take notes on their reduced size copy on the table. The Process Engineer talks through all the equipment and all the lines and all the instruments and all the reactions happening in the equipment. The attendees ask questions about key issues that interest them or effect them as the meeting progresses. The process engineer may state that a certain line must be "Sloped". Many process engineers just say "Slope" and they think that covers everything. The piping designer will want to understand why it must slope, which direction it must slope (up or down) and want to know how much slope. The main crude feed line from the Feed Heater to the Crude Fractionator is normally at about 800 degrees F, it is a critical line and (in my experience) it must slope up (1/4" per foot) in the direction of flow from the heaters to the Fractionator. This is so the vapor in the line rises and migrates to the Fractionator. The piping designer wants the process engineer to yellow off each line and describe every thing that needs to be done in or by each line. Are there any critical control points? Are there any critical points of operation? Are there any critical repeat maintenance points (once or more times per shift). The piping designer is responsible for turning the flat schematic diagram into a full three dimensional and functional plant. To do so he or she wants to know everything. Ahh, I remember when that was the case .... the good old days! From recent experience (over the last 10 years or so), I have found that a lot of projects I've worked on have adopted the "fast track" approach. While this may appear to be the quickest, cheapest, most efficient method of project execution, it is frought with pitfalls - particularly for the piping designer. 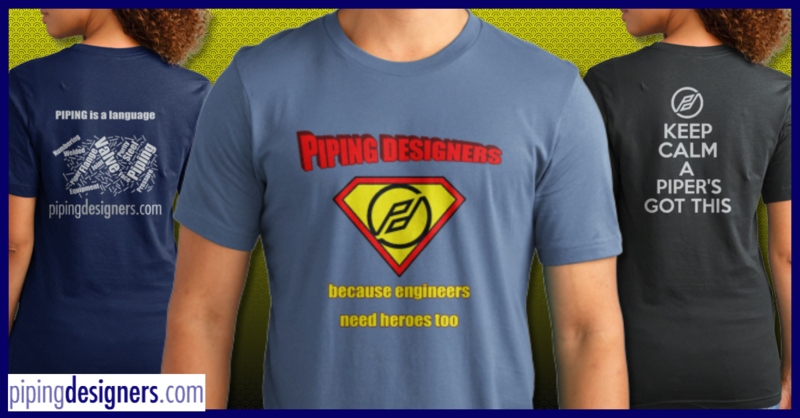 With this method, piping design starts in tandem with P&ID development (... I know, I know ... ), and the piper often has nothing more than a draft PFD on which to base the equipment layouts. You must guess equipment sizes based on preliminary PDF capacities, take a wild stab in the dark at line sizes, populate lines with valves, strainers, meters etc based on previous experience. While this is being done, the process guys are trying to put together P&IDs while you hound them for information. As the P&IDS are developed, it is often found, especially in the utilities end of the projects, that the overall mass balances for the projects are nothing remotely like what they started out at, and so it is time to revisit all your previous line sizes. This cycle will continue for many iterations of the P&ID until finally, the IFD P&ID arrives, in it's signed off, frozen for design form. Piping then start getting kicked by project management for holding up the job .... "what do you mean it's not done yet, you have all the P&IDS!" Unfortunately on these types of jobs, Issued for design (IFD) P&IDs, usually signal the checking phase of the piping process! Have any of you guys shared these wonderful experiences?